The engine is based on the experience from MotoGP. The heart of the development were the cylinder heads of the MotoGP racing engine. Due to the same dimensions and design features, they have the same flow conditions. The installation will also be identical with the MotoGP. It is installed 42 degrees to the rear. This results in good mass centralization. The crankshaft rotates in the opposite direction to the direction of travel, thereby reducing the stabilizing centrifugal forces of the wheels, making the motorcycle more agile. In addition, it reduces the wheelie tilt during acceleration and the tendency of a lifting rear wheel when braking. The crankshaft offset is 70 degrees. The “Twin Pulse” sequence (explanation below) is intended to provide a controllable power development with optimized traction at the curve output, ie during acceleration. 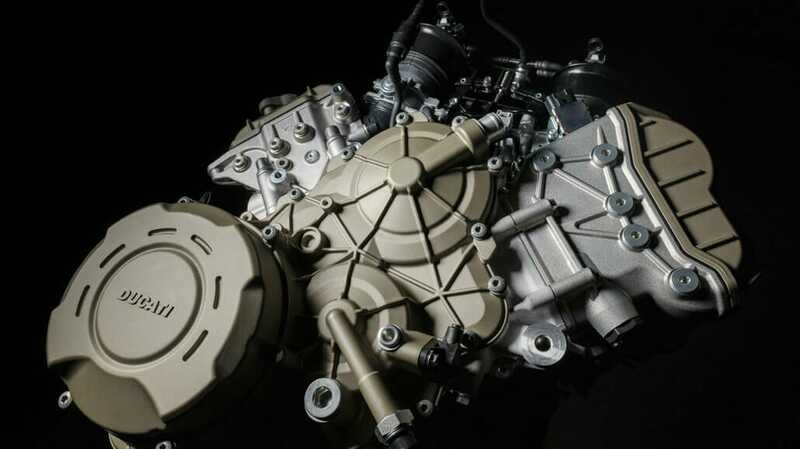 How much does the new Ducati V4 engine perform? 1.103 cc has the engine and thus has more displacement than the counterpart in the MotoGP. 155 kW respectively 210 HP , the Euro4 compliant engine delivers 13,000 rpm. Between 8.750 and 12.250 revolutions, more than 120 Nm of torque are permanently present. This means that the engine is also well-suited for road traffic, since this is usually used in the medium speed range. Of course, desmotronics is used to control the four valves per cylinder. The cylinder bore has a diameter of 81 mm. This is in accordance with the MotoGP regulations and the four-cylinder super sports segment. The throttle bodies are equipped with variable intake funnels in order to be able to adapt the length of the intake paths over the entire speed band. This is intended to improve the performance development and dosing. The right mixture is controlled via oval throttle bodies with two injection nozzles upstream and downstream of the throttle valve. Thanks to the space saved by the compact engine, there is room for a water pump and a 12.8-liter airbox inside the V.
Semi-dry sump lubrication is used. Four pumps are used for this purpose. A chain-driven rotary pump delivers the oil as a pressure pump, and three pumps return the oil. The Desmosedici Stradale is constructed as a supporting element of the frame. The frame is connected at the front with the upper crankcase halves, at the rear with the cylinder heads. The swingarm and strut are mounted directly in the crankcase. The new Ducati engine weighs 64.9 kg and thus only 2.2 kg more than the 1.285cc Superquadro Twin. The engine has a crankshaft displacement of 70 degrees and produces a twin pulse ignition sequence. This corresponds to the operation of a double two cylinder. In each case, the two left and also the two right cylinders ignite almost the same. Ignition at 0 degrees, 90 degrees, 290 degrees, and 380 degrees. At 0 degrees the front cylinder ignites on the alternator side and at 90 degrees the rear cylinder on this side. This is followed by an interval in which no torque is generated until the two cylinders on the clutch side ignite. Also offset by 90 degrees.